After ten long years, Creative Assembly returns to the setting that started it all. Shogun 2 Total War is awesome. I've been a fan of Creative Assembly's games ever since Shogun was originally released a decade ago, so the fact that the studio is applying ten year's experience and growth to recreating the warfare of feudal Japan is almost more than I can handle. This year's E3 is Shogun 2's first public showing and, even though I had seen the title a few months ago, it was still high on my list to check out at E3. Fittingly, Creative Assembly's take on Japanese warfare emphasizes art and simplicity. The stylized art for the game's event cards and interfaces draws directly from the 16th century while the scaled down list of around 30 units (versus the dozens and dozens found in Empire) should have players focusing more on tactics than unit match-ups. That's not to say that there won't be some variety among the units; players will have to manage archers armed with flaming arrows, peasants equipped with ashigaru spears, and mounted samurai wielding katanas. Depth with simplicity seems to be the guiding philosophy behind the game. But as always, the game speaks better for itself than any description can. After a quick view of the same concept art that was first released when the game was announced, Creative Assembly launched into a more complete version of the demo we saw earlier this spring. In it, the forces of Chosokabe faced off against the forces of Takeda in a nighttime, rain soaked battle. The general speeches will be composed of numerous elements that all vary based on context. Depending on your particular situation, you may find yourself hearing a rousing speech that specifically mentions your enemy's position, or the fact that your forces lost the last battle. The permutations are said to run into the hundreds of thousands for these speeches. Players can opt to have them delivered in Japanese with appropriate subtitles, or simply have them spoken in the player's own native language. As the troops were being motivated, we took the time to check the map details, including rain collecting in puddles and buildings burning in the distance. As in Empire, players will be able to garrison buildings on the battle map, but these are an attractive target for enemy archers, who can set these buildings on fire with fire arrows. In addition to destroying your enemy, the flaming structures show off the deferred lighting system that makes the return of night battles that much more spectacular. There's nothing like seeing row upon row of samurai all lit up from their hand lanterns. The battle itself fulfilled all the expectations we had. The samurai marched in first and the new animation system and motion capture gave the combat a realistic dimension that exceeded anything the series has shown to date. The samurai were soon repulsed by volleys of flaming arrows fired from archers in a nearby forest. As the samurai pulled away, the centers of each army, composed primarily of peasant spearmen, crashed together in the middle of the map. Chosokabe was getting the worst of it for a while until he sent his cavalry around to take out the archers in the forest and then crush Takeda's flank. The ebb and flow was very engaging at every level, from setting up the lines and engagements from high up in the air, to diving down to eye level to see the combatants fight it out with each other. Though this particular battle didn't carry us this far, Shogun 2 will also have new siege elements. Three different kinds of castle - coastal, plains, and mountains - will each have five different upgrade levels, so players will have a total of 15 different castle setups to battle over. 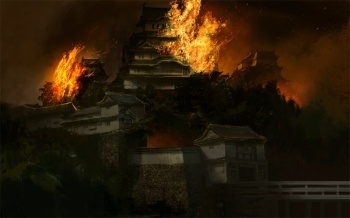 And unlike the European castles, which focus on a single wall and a single breach, Japanese castles will feature lots of fun choices and opportunities for both the attackers and the defenders. We still haven't seen any coastal battles in action, but the demo today at least showed us a real battle map for naval fighting. It's strange that it included ships at sea and soldiers on land because Creative Assembly has repeatedly said that there will be no real time battle interaction between land and sea forces. In any case, we got to see the numerous inlets and rocky coastlines that will play a part in players' sea battles. The developers weren't willing to offer any firm details on multiplayer, but they did mention that anything that's already in Napoleon will likely be in Shogun 2. More interesting though, are the hints that the new game's multiplayer will feature some sort of persistent element. Right now the game is in pre-pre-alpha, which means that features and details are still subject to change. Look for Shogun 2 in 2011.